We have a den meeting on Tuesday, March 25 and Liam, Mrs. Dellinger, and special guest will work with the boys on the Engineer badge. 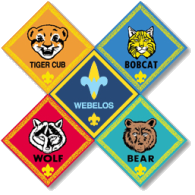 This will also be the last opportunity to earn new badges to be awarded at the April pack meeting. Please bring completed activity worksheets on Tuesday evening for credit. - Activity Worksheets (Completed Only) in a folder with your name on it so they don't get lost.